This paper helps exemplify some of the truly unique attributes of Datto—from technology, to product, to service, to leadership, to our valued Partners and their clients. It’s easy to see what makes Datto the award-winning backup, disaster recovery and intelligent business continuity leader, with a 100% channel focus. 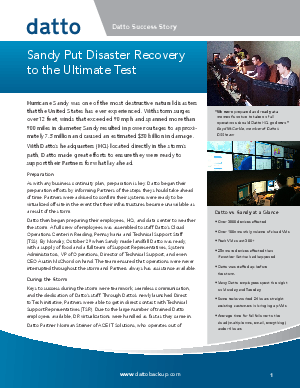 Everything planned for and implemented during Superstorm Sandy are valuable lessons for everyday, successful backup and disaster recovery.